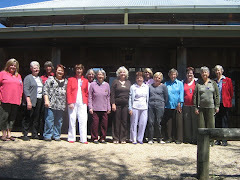 The first post on the Lake George Day VIEW Club blog site should indeed be a regal one and as such it is only fitting to post a photo of the ladies who were the 'guides' at the open house at the Governor General's House in Canberra in March of this year. Our own President Pauline Segeri is in the front row on the left hand side, National Councillor Rhonda Spottiswood centre right and Zone Councillor Area AA03 Fiona Spottiswood is also in the front row at the front right hand side. I want to congratulate you on the creation of the website for Lake George Day VIEW Club. Good luck with forthcoming publicity.